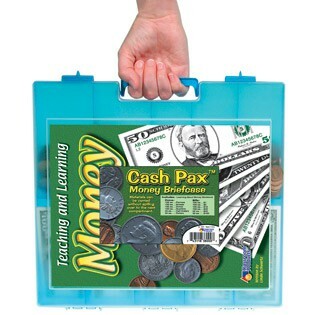 Keep your school money sorted and organized in this handy spill-proof storage case. Includes an assortment of coins and bills: 100 each of pennies, nickels, dimes, and quarters; 25 each of half-dollars and Sacajawea dollar coins; 100 each of dollar bills, fives, tens and twenties; 50 each of fifties and hundreds. A total of 950 coins and bills! Also includes our 64-page Teaching and Learning Money Activity Book, full of exercises, problems and games that help students practice bill and coin recognition and reinforce basic math operations.